Late Thursday night, Indianapolis Colts fans finally got word that their team had dug into the abundance of cap space and signed a player that will immediately fill one of their biggest needs. According to ESPN’s Adam Schefter, the Colts secured the signature of edge defender Justin Houston, formerly of the Chiefs, to a two-year deal worth around $24 million. The signing of Houston makes a lot of sense for the edge-needy Colts, and the ninth-year veteran will enter the 2019 season as a definite upgrade to a lackluster pass-rush unit and arguably one of the best bargain signings of the 2019 free agency period. 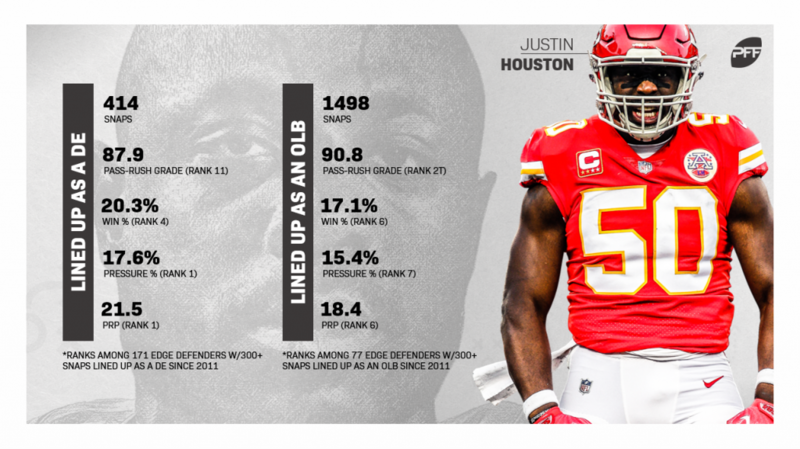 As PFF Data Scientist Eric Eager wrote earlier this month, Houston was a truly great player for the Chiefs, earning over a 75.0 PFF grade in all but his first NFL season, and an overall grade above 90.0 in each season from 2013 to 2015. He was a force as a pass-rusher as well as a run defender, racking up 408 total pressures and 285 run stops on over 6,400 career snaps for the Chiefs, and in our wins above replacement (WAR) metric, Houston was worth over four and a half wins, trailing only Alex Smith, Patrick Mahomes and Travis Kelce among his teammates during that period. During his time in the NFL, Houston has been one of the most consistent players at the edge position, and his ability to win his matchups and generate pressure is a huge reason why. Houston has recorded single-season pass-rushing grades of at least 80.0 in four of his eight NFL seasons and has produced at least 44 quarterback pressures in six of those eight seasons. Over his entire career, Houston has won 16.3% of his pass-rushing snaps and produced pressure on 15.3% of those snaps, both of which rank fourth among edge defenders with at least 2500 pass-rushing snaps in the PFF era. Houston will provide an immediate upgrade to a Colts defensive line that combined to produce a team pass-rush grade of only 64.0 last season, a mark that finished 29th among 32 NFL teams, while the team’s group of edge defenders managed a cumulative pass-rushing grade of 59.9 which finished 28th among the 32 units. Given how valuable edge pressure can be for a defense, the addition of Houston is set to fix a problem that has been evident for quite some time now. Over the last 13 seasons, only three Colts players at the position have topped 50 single-season pressures, and if it weren’t for Jabaal Sheard (67 pressures in 2017 and 56 pressures in 2018), the last edge defender to top 50 single-season pressures would have been Robert Mathis, who did so in 2013. Houston will now line up opposite Sheard to give the team the consistency they so badly needed at the position last year. In 2018, Colts edge defenders not named Sheard, a group which consisted of five players, combined for just a 57.4 pass-rushing grade and 76 pressures, whereas Houston single-handedly tallied an 89.1 pass-rushing grade (which was the second-best mark of his career) and produced 59 total pressures. As is often the case when superstar players change teams, pundits will be skeptical about how those players will produce in new surroundings and new schemes, and you can rest assured that the same will be true when Houston transitions from his familiar outside linebacker spot that he had in Kansas City’s 3-4 defense to having his hand in the dirt as a part of Matt Eberflus’ 4-3 scheme. Should they be skeptical? Well, no. When lined up as a defensive end in Kansas City, Houston showed just as well as he did when he lined up as an outside linebacker. From his 414 career pass-rushing snaps as a defensive end, Houston has notched an 87.9 pass-rushing grade which ranks 11th among the 171 edge defenders with 300-plus snaps lined up as a defensive end, while Houston’s pressure rate of 17.6% and pass-rush productivity of 21.5 both rank first among the same group of players. As Houston has shown over recent seasons, he’s got plenty of gas left in the tank, and his reign as one of the league’s best pass rushers is far from over. Whichever way you slice it, you can make the case that the newest Colts signing is one of the best of free agency so far, and one that will immediately improve an already dangerous team.